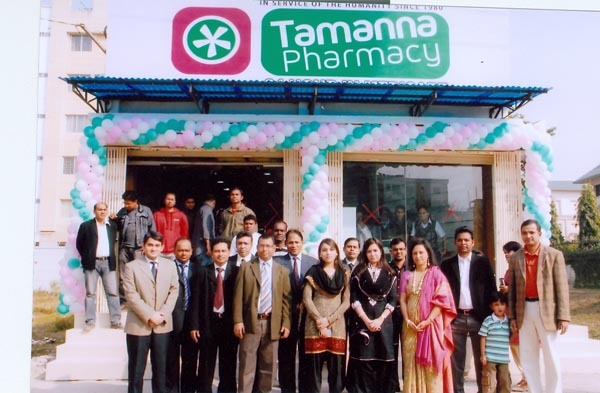 Tamanna Pharmacy, a long serving well known drug house, started the operation of their new branch at Bashundhara Residential Area on January 10, 2010. Tamanna Pharmacy has been serving the people for long 30 years from their Gulshan Branch. They provide 24 hour service to the people. The directors of the Bashundhara Group Sabrina Sobhan and Iasha Sobhan inaugurated the new branch adjacent to the Apollo Hospital. The Managing Partner of the Tamanna Pharmacy Anwar Hossain Belu, Partner Tuhin Akter Sheuli, Partner Moshiul Karim Lipu, High Officials of the Bashundhara Group and many respected residents of the Bashundhara Residential Area were present there. Copyright © 2013 Sayem Sobhan Anvir. All Rights Reserved.